In N.Y. Policy on Out-of-Network Medical Bills, a Model for Other States? This was published as a Wall Street Journal Think Tank column on January 11, 2016. Medical bills for out-of-network providers can surprise consumers with thousands of dollars in costs they didn’t plan for and sometimes cannot afford. I’m among those who have experienced this surprise despite efforts to determine that all my health-care providers are in-network. 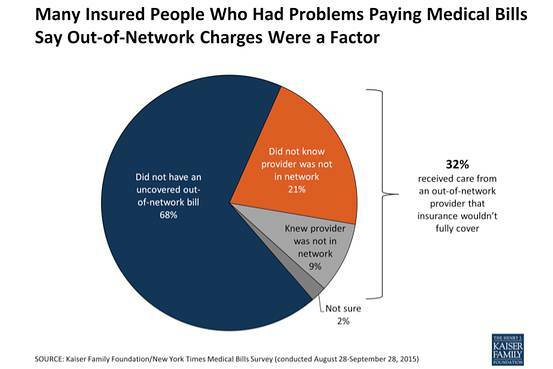 As the chart above shows, a significant share of people who had problems paying medical bills say that the issue was charges for providers they did not know were out of network. New York state has a solution to this problem that bears watching. Under the New York policy, patients who are surprised by out-of-network bills pay only the amount of their regular in-network cost-sharing provided they fill out a form authorizing the provider to bill the insurer for the remaining amount. Emergency-care patients are held harmless from out-of-network surprise bills. Self-insured employer plans, which represent a significant share of larger employers, are not bound by the policy. Other aspects of the policy, including an arbitration process for providers and insurers, are described in a new analysis of surprise medical bills by the Kaiser Family Foundation. The key is that providers in New York are prevented from billing consumers for an outstanding balance if a patient discovers after receiving care that providers–say, an anesthesiologist or an assisting surgeon–are not in-network. New York’s approach won’t entirely do away with “balance billing,” but it places the onus on providers and insurers, not consumers, to work out who will pay surprise bills for out-of-network care and how much will be paid. Among the questions raised: Will patients understand the process and be able to follow it? Will the policy lead to fights between insurers and providers over payment rates for out-of-network care? Will costs be passed back to employers and consumers in other ways? How will provider participation in networks be affected? Time will tell about answers to these questions and whether this consumer-first approach to a problem that strikes patients as patently unfair is a model for other states.